Get your brand in the promotional mix when you offer this trail mix snack bag as your next courtesy gift to your clients! This 1 oz. 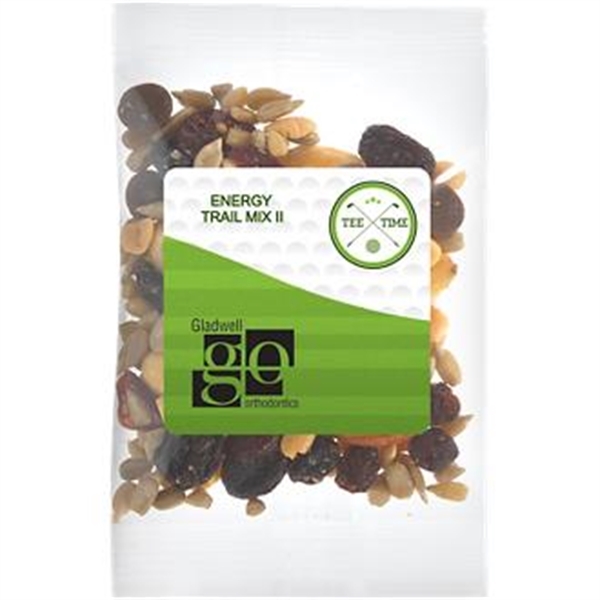 bag of healthy trail mix exceeds global food and safety requirements from SQF. Customize the imprint area on the sticker on the front of the bag with your company name or logo for added brand exposure. Or, make this a snack to give away at your next corporate golf outing and pick from our stock golf motif to place on the sticker. Get on the trail of promotional success with this great snack bag! 3-1/4" W x 4" H.
Size: 3 1/4 " x 4 "